Awaken the hero within with a bang and dominate the arena in this fast-paced objective-based free-to-play MOBA (Multiplayer Online Battle Arena) that’s trespassing on hilarious. Because, not all heroes wear their underwear on the outside; some wear dragon cheek skin pants (what?!). Join these weirdest everyday heroes with their wackiest epic superpowers on the streets of a seemingly peaceful town! Play with your friends or alone and use the right team strategy to annihilate real opponents before they can say “witch’s spit unicorn horn” in very satisfying 5 to 10 minute insanely competitive real-time 5v5 battles on a three-lane map. 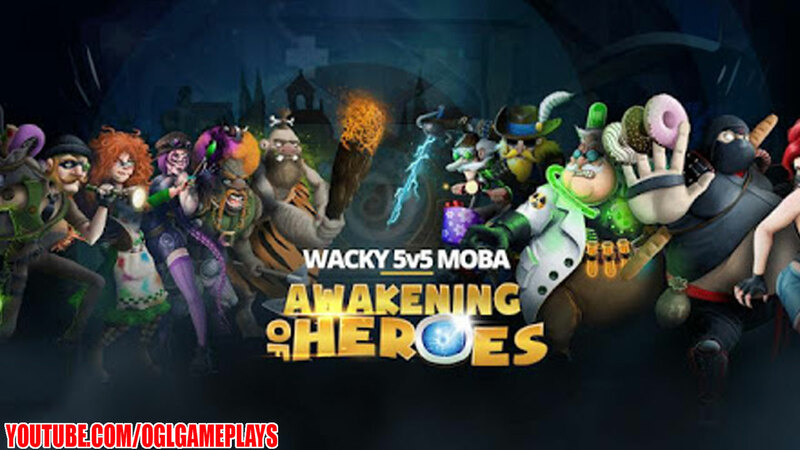 On top of a classic MOBA gameplay, Awakening of Heroes brings most jungling ever, new strategies, more teamwork, and astonishingly entertaining but deadly power-ups. Summon grumpers (who are grumpers, you might ask?) and Big Boss, seize bombs to destroy towers. Hold on to your paper hat as you go through a black hole behind enemy lines and don’t forget to plant (what, what?!). Become the master of the arena, but take a moment to stop and smell the smoke as a defeated tower waves a white flag! Heroically download for free now! A police officer, a thief, and a chimney sweeper walk into a brawl. No, this is not a joke. There are heroes among us, as weird as they come. A bingo champion granny who bakes a killer cake (we mean capital K). A warm-hearted math professor turned butcher skilled in close combat. A mime artist with a parrot on her shoulder and an imaginary hammer. Throw “happy last birthday” cakes with explosives instead of candles, turn your enemies into pigs or watch your paper planes fly towards your foes just like pigs wouldn’t. Make your own fighting ring inside the arena and challenge another hero to a duel in the middle of a street. And make no mistake, it’s not over till the fat magician sings! Sure, clothes don’t make a man but chicken breast armor is useful when delicious doughnuts are flying your way. Well, delicious and deadly doughnuts. Dress for the role you want: strap-on your cat fur laced dragon claw or a candy cane widowmaker and, of course, fairy godmother’s onion ring, because a well-equipped hero is a breathing hero! Put on your tinfoil hat, cacti underpants and soda can ring and enter the battle! These are not just for show, but if by some chance you are going to lose, might as well look dashing going down. Gather experience as you win battles against real players worldwide to progress to the top through 15 arenas designed for state-of-the-art matchmaking. As you level up, upgrade items and claim achievements to reach new levels of your hero’s armor, speed and damage. There are only two kinds of heroes in the world – those who use their superpowers wisely and those who lose. In order to destroy a tower instantly and without casualties you can score a touchdown NFL style, only with a bomb. Before that, you must steal a bomb. In order to steal it you must defeat a bomb guardian, but first, you must beat your enemies to it. And in order to do so, you should… – oh, you get the point. Don’t panic, there are many ways to skin a tower. Defeat another guardian with the help of your friends to unleash the ultimate tower destroyer – Big Boss. Or plant your way to victory as your bioweapons of mass destruction shoot at towers, trap enemies, heal allies or just serve as decoys! Use a black hole and teleport to sneak up on enemies while your teammates defend healing wells. Collect mystery box powers-ups that can change the course of a battle and will leave your opponents speechless! Set mousetraps, become invisible or unleash a chicken bomber fleet of on your foes. All of that and more in a 6 minute lightning-fast epic real-time battles against real players! Related Tags: Awakening of Heroes.